In Matthew 25:31-46 Jesus is talking about separating His sheep from the goats. He tells his sheep they have done well in treating their fellow men. They are curious about how they did that. He tells that when they visited folks in jail, among others things, they visited him. Since 2011 men from Buck Run have been going to jail each Thursday night to have Bible study and share Jesus with the inmates in the Franklin County Regional jail. Each session lasts an hour and the inmates enjoy knowing that someone is thinking about them. In addition to the Bible study there are several Buck Run ladies that write cards and notes of encouragement to the attending inmates each week. Over the years dozens and dozens of inmates have attended the Bible studies and have been touched in Jesus name by the weekly visits plus the cards and notes. The inmates love the cards and notes! Most of them keep all the cards in their bibles. Men are needed to serve one Thursday a month to go the the Franklin County Jail and lead the Bible Study. If interested, please email Scott Riessen at sriessen@buckrun.org. Women are needed to write cards to the inmates that attend the Bible Study.If interested, please email Scott Riessen at sriessen@buckrun.org. 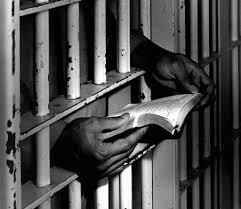 Pray that new inmates will attend the Bible study and be encouraged by God’s messengers and His Word. Pray for wisdom and courage for the volunteers leading the Bible study.